Poor Popeye. 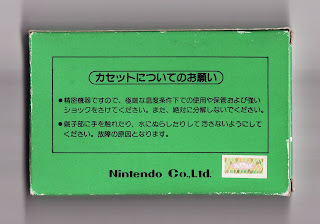 Thanks to Donkey Kong and Nintendo's main man, Mario, everybody's favorite (or not) middle-aged sailor was all but ignored during the Famicom's earliest days on the market. That's too bad, because this arcade conversion--which tasks the titular seaman with collecting the hearts, letters and musical notes of his true love, Olive Oyl, while avoiding the fists of his mortal enemy, Bluto--is both an accomplished (for its time, anyway) and enjoyable one. Is it as accomplished and enjoyable as fellow launch titles, Donkey Kong and Donkey Kong Jr.? Not really--Popeye's graphics and music aren't quite as "arcade accurate" as its gorilla- and plumber-filled counterparts, for instance--although that's not to suggest it's not worth owning. On the contrary, this short (it's just three stages long), Shigeru Miyamoto-designed game is well worth adding to your collection if you're a fan of old-school platformers--or particularly awesome cover art. Ah, see, that proves my point about it being overshadowed by Donkey Kong and Donkey Kong Jr. (and likely some of the other launch-window Famicom releases)! Anyway, you'd probably like it Simon, although like I said in the review, it's a bit short/repetitive, just like DK, DK Jr. and Mario Bros.
That is a good one, I like Popeye! There are two versions of this cart, BTW. The pulse line version and one with the picture art on it. The pulse line one is the most common, the one with the picture is quite hard to find. Which is a shame because I really want it! Thanks, Sean! That's an interesting note, by the way. 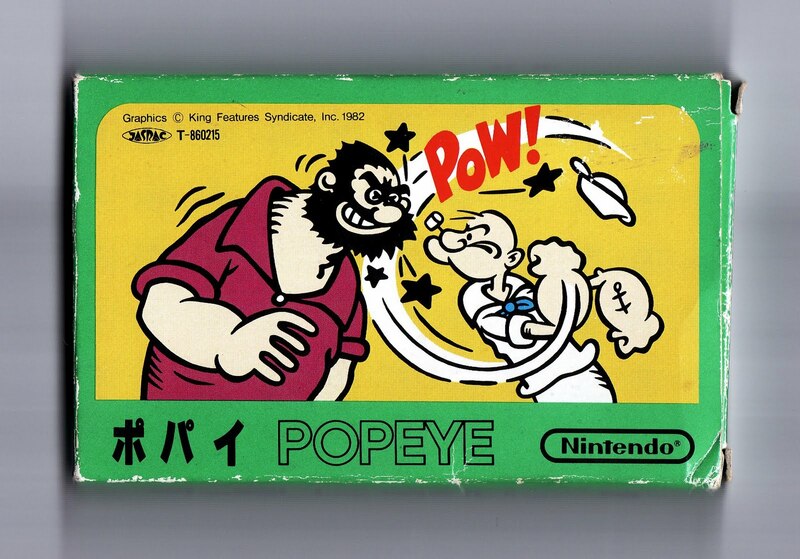 I knew some of the early releases had the picture art on the cartridge -- namely DK Jr., Mario Bros. and the sports games -- but I didn't know that was the case w/ Popeye, too. Did all of the early releases get this treatment? 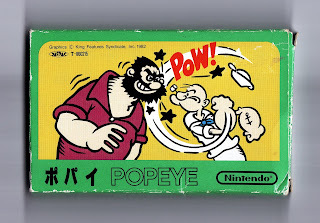 I remember playing Popeye on the Atari...and the arcade, I think. I loved it at the arcade. 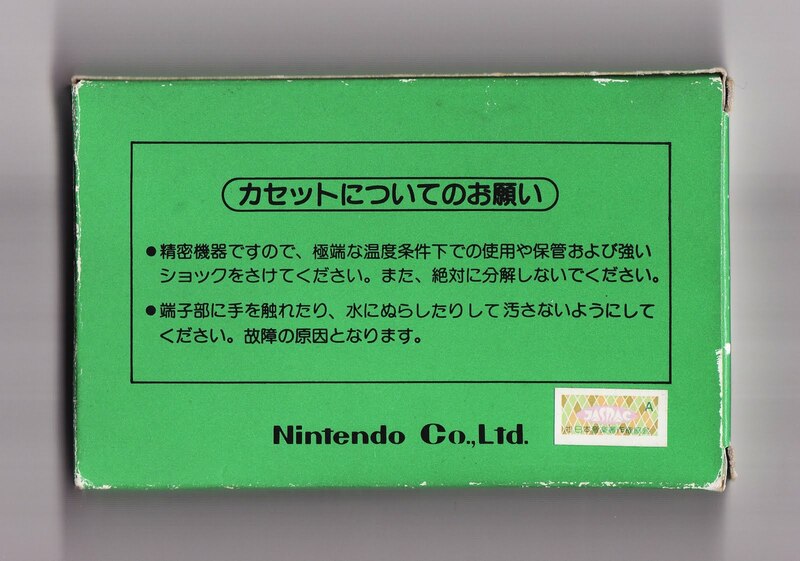 I never knew there was a Famicom port. Is it a port? Yes, as far as I know. I've never played the arcade version -- I've just seen screens of it -- but from what I've seen and heard the Fami version is a port of it.